This camera is superb, very ergonomic, confortable, and the grip adds a lot of fuctionality to it. The colors are beautiful, and with the right lens, it is razor sharp. Great performer at high ISO, i've took amazing night shots with it. I just love it, this camera is right for you to grow up with. Hi Joenov15, now we know your list of cameras. so? I am pleased thus far with my Pentax K10D. I have been a Pro Photographer for about 25 years. I am a Canadian based in Paris, France.I have worked in New York, London, Paris, Milan and LA and have used everything from Bronica to 'Blad's to Sinar to Fuji 680 to Pentax 6-7 and 645 and Canon. I was sponsored here in France by Canon. I had been quite curious about the new direction of Pentax and their affiliation with Samsung and Tokina/Hoya. I always loved Tokina lenses especially their 80-200 f2.8 lens. Most of my work gets published in magazine and on occasion as PLV's and catalogues. In almost all cases I used my 8 MP Canon camera's for all of my magazine work. To my point of about two months ago, I decided to go with Pentax and am now sponsored by them. I made the decision to switch because of the fine reputation Pentax has had with all of the pro studio photographers. I just think that the K10D does 80-90 percent of all of the things I would expect from a camera. I am also using all of their pancake lenses as well as their 12-24, 16-45 and 100 macro. I will receive the 16-50 and 50-135 when they come out in March. I have just used the K10D for an up and coming editorial in "Issue One" magazine UK as well as a twelve page Fashion Editorial called "Diva" It performed flawlessly. The only issue I had was the SD card I used was too slow and have now changed to a 133x card. Le K10D est un excellent boitier bien fini, agréable à utiliser et propose à lui seul l'ensemble des fonctionnalités des autres appareils de sa catégorie ( Canon 400D, Sony Alpha 100 et Nikon D80 ). Le problème est, qu'à l'heure où j'écris ces lignes, il ne semble pas bénéficier de l'intégralité de ses neurones. N'y a-t-il pas un problème ? De ce fait, sans renier les qualités de cet excellent appareil, j'ai l'impression, subjective peut être, d'obtenir des images moins définies qu'avec mon D7D ! Je pense que l'appareil va évoluer et que le nouveau firmware remettra les pendules à l'heure ! I am not sure if I would agree with Lou on ability of Nikons D80/D200 or Canons 30D/20D to deliver images which are superior to D70s or Pentax K100D in terms of dynamic/tonal range scrispness, clarity and , specifically, sharpness. The problem is that 8 Mp or 10 Mp sensors on these "non-pro" cameras simply cannot be supported by existing technologies of manufactruing of bodies to absolutely tight tolerances and inferior lenses. If you shoot with 8/10 Mp camera manufactured on "affordable" level of technology for non-pros and without image stabilizer,- don't expect wonders, they don't exist. What Canon/Nikon failed to realize is that the majority of those people who buy cameras and lenses in $1,000 price mark, require more than marketing gimmick like Canon 350D or Nikon D80 aimed on higher sales but not the quality of the images. Here is the breaking point when it comes to difference in the media of CMOS vs. CCD sensors. Who cares about lower noise at ISO1600, which Canon is praised for, if you have to pay price for softness, loss of details and colour fading ? As for Pentax K10D, there is no doubts that the only failure of this camera ( hopefully they will be able to fix it in firmware update ) is lack of sharpness for JPEGs due to poor engine processing. No other camera on the market including even 5D or 200D offers image stabilizer, dust reduction and "digital" preview in one affordable package, nevermind it is still better than all those above IQ wise. I am just judging by Pbase collection of shots, whereas Nikon 70Ds/50D and Pentax K100D come first, following closely by latest Panasonic DSLR. 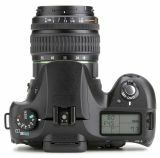 IMO Pentax K10D resides in class on its own in every single respect, and what they need to do in the future is to get 7.5-8 Mp sensor in its body and return back to the same processing engine as they already have on K100D. Someone just wrote it: "this thing will be in a new class", just only between a D80 and a Sony Alpha". Poor K10D. So, lets stop joking. The K10D is a hughe camera that makes quite excellent pictures. It beats picture quality of a Sony Alpha and is quality equal with the D80 when run in low iso ranges. At high iso ranges and, for sure, in autofocuing ability, the D80 is a genration better. But, all those cameras are not made to bring you a better or whorse picture when compared to each other. There main goal is continuity when you ow a lens park for the mount and here Pentax follows modern marketing strategy by opening the 10 mpix offer to their customers. Note that still today a 8 mpix Canon 20D or 30D makes a better picture then any of the recent 10 mpix guns. Only the D200 can compete with it, despite of Canon's weaker AF ability. So, does one realy needs 10 mpix like companies trie to make you believe .....? - It's a good question, isn't it ? Canon and Nikon have proven reliability. Pentax unknown. It seems like the Pentax K10D is a good solid camera. I'm looking forward to the reviews. looks nice but iq =???????????? Poor D-80! This thing will be in a whole new class! Ah! Here is THE KING!! Don't disappoint me, honey!